My bad for being a day late with this, but it’s a holiday weekend so you’ll forgive me, right? With all the rainy gray weather we’ve been having lately, B and I were just in the mood for a hearty bowl of soup. This recipe sounded like the perfect remedy. We made a couple minor tweaks and added some crumbled bacon on top and it was so yummy! Melt butter in a Dutch oven over medium heat. Add leeks and bell pepper, and cook, stirring occasionally, until tender, about 5 minutes. Gradually whisk in flour, and cook for 1 minute. Then add milk, whisking constantly, until incorporated, about 1-2 minutes. Stir in vegetable broth, corn kernels, potatoes, creole seasoning, thyme and salt. Bring to a boil; reduce heat and simmer until potatoes are tender, about 20-30 minutes. Serve immediately, garnished with chives and crumbled bacon. Looks so good! I love soup and pho on a chilly or rainy day. 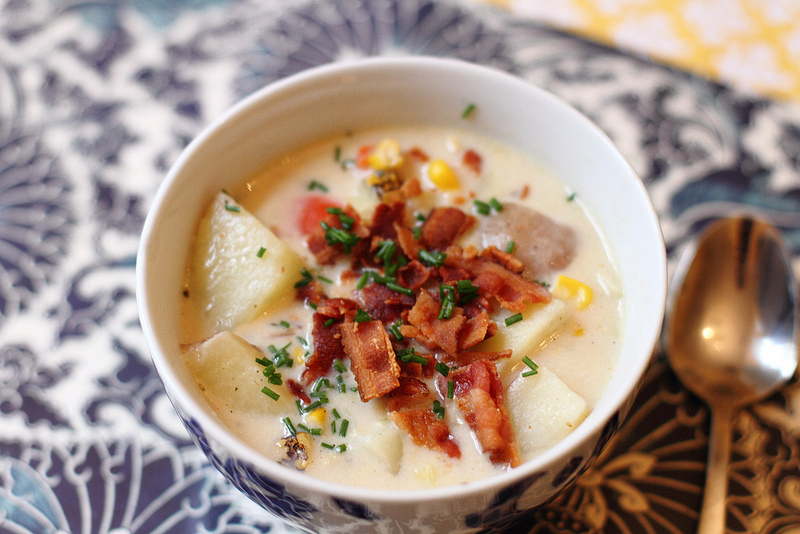 I really love corn chowder. It's one of those soups I'm happy to eat year round. I've never tried it with a bacon topping though… going to have to remember that for next time! It does look delicious and perfect for Fall. Too bad we are re-living summer here again this week. Our weather is all over the place. Very unpredictable from one week to the next.